THE MOST COMPLETE: It does it all and it’s all-in-one; there’s no need to use a confusing combination of other applications. THE MOST INNOVATIVE: In 2016, DietSensor was crowned as the world’s most innovative application by CES in Las Vegas. Scan your foods to have them analyzed using two scientifically-based scoring systems so that you eat less fats, salt, sugar and processed foods. with our morning tips that will start your day right ? Never guess weights again. Serve exact portion sizes, to the ounce. It is really possible to reverse your diabetes. “After a long illness, I went from 139 lb to 271 lb in 5 years, which led me to obesity. For my own sake, I need to undergo a strict diet to lose the excess pounds in order to be healthy and for my professional career. I’ve tried numerous diet sites, nutrition apps and paid coaching but in vain. Looking at my current diet; which mostly consist of bread, pasta, pizzas and parmesan, I must say I am a lost case. While configuring the DietSensor app, the caloric budget proposed was similar to what was prescribed by the doctor. The distribution of macronutrients and other parameters gave me a confidence and trust with regards to the efficiency of the app. That means I have truly learned to add on the “good” fats without being afraid of decreasing carbohydrates, and that is how I found a peaceful relationship with food. Whether I am losing 2 to 5 pounds per month, I am now at peace with my eating habits and DietSensor has become not only an indispensable app for my health but a nutritional companion as well. The road ahead is still far from over, but can definitely say I’m heading forth with my head high. Since I’ve been using DietSensor, I am more cautious with my meal, especially during my night shifts. The tracking and logging tools are second to none. Data is added instantly on the fly and I easily can import my Fitbit data into DietSensor so I optimize my complete fitness and nutrition regimen. I can adjust all my macro nutrients for my power lifting needs (high protein fat loss being my goal). Love it! “Since I’m using DietSensor’s app, the results are clearly visible on my silhouette! After going through all kinds of diet, I had reached a point where my diet had become completely unbalanced and thus leading to severe nutritional deficiencies! Or, since I’m using the app, I eat better. And the most amazing part of it is that I’m eating more but I get slimmer! Yes, all this is possible with the DietSensor App! As DietSensor allows you to balance your meals and accurately manage your macro nutrients and caloric intake. “I take this opportunity to congratulate you for the quality of the tool you have developed: the database is huge and it helps me a lot. I suspected that I had problems balancing my diet; I thought it was carbohydrates and it is Fats and Calories. It allowed me to rebalance easily, without feeling hungry. “The DietSenser app also allows me to choose the amount of food I should eat. I must admit I never came across any other nutrition app that allows me to customize my nutrition to my Diabetes. Although I did see later that the app is customized for Type 1 and Type 2 diabetes as well as obesity. The diabetes coach is great because it offers useful information. It even makes suggestions that are unique to my condition. And it also makes suggestions for alternative meals or how best to combine meals. “Many apps help you track your food intake but DietSensor makes tracking easy. After launching DietSensor on my iPhone and turning on the Bluetooth scale, I put the food on the scale and the food’s weight appears on my iPhone. Then I scan the barcode from the food’s package with my iPhone’s camera and immediately see the nutritional data for the food I am about to eat. If the food’s barcode is not available, I can search DietSensor’s extensive nutritional database or I can use the SCiO scanner to retrieve the nutritional statistics. Once the food is found, I can save it, along with a photo, into my favorites for easy retrieval the next time I eat it. As I record my food I see a graph of how I am doing against my daily nutritional goals. One area where DietSensor shines is when your meal consists of many different ingredients. Let’s say you are eating a multi-vegetable salad with a protein like chicken. You place your bowl on the scale and press the add food button. Put chicken in the bowl and identify it and press add. Chicken statistics are recorded. Put your next food in the bowl – say carrots. DietSensor immediately recognizes that the weight has changed and let’s you identify the food and then add it. Keep going with whatever else you want in your salad. In the end, you get an accurate nutritional analysis of every item in your salad. It’s easy and fast. At the same time, you can see how your salad lines up with your daily goals and which carbs, proteins or fat might be lacking. This feature is also great for building and recording recipes. DietSensor also pulls data from many fitness trackers – including the Apple Watch. As I exercise during the day, I can see my totals being adjusted for the calories I have burned. No input from me – it just happens. I don’t have to launch the watch app – the data moves seamlessly in the background. If you want suggestions of what to eat for each meal and encouragement, DietSensor offers that too. The amount of handholding and interaction is totally up to you – more at the beginning when you need the help and less as you are maintaining your healthy life style. I have also been very impressed with the responsiveness of the DietSensor team to my feedback and suggestions. They want DietSensor to be easy to use and to help users achieve a healthy lifestyle. Every update to the app shows they are listening to what users want and need. What is fitness exactly? Some people are confused about the nature of fitness. Is there an absolute barometer that gauges an ideal fitness level or is fitness defined by the individual’s personal fitness goals? Are health and fitness mutually exclusive, or does one need to be both healthy and fit in order to be at their best? In order to get fit, should one burn calories or is fat burning the preferred choice? Ideally, a comprehensive health and fitness regimen should include fitness programs that offer different targeted activities. Focusing on only one aspect of fitness training during a workout is rarely optimal. Instead, it’s much better to change things up with full body workouts that include high intensity, cardio, and building strength exercises along with other specialized exercise programs that, for example, focus on specific major muscle groups. Everyone wants to get fit, but everyone also has different personal fitness goals which needs to be taken into account. Changing up the type and range of physical activity keeps the body on its toes which in turn will strengthen its ability to continue to adapt to whatever is thrown at it. Correlating healthy eating and fitness is where the DietSensor app comes in. The fuel that one puts in their body has a direct impact on the body’s usage of its fuel reserves. 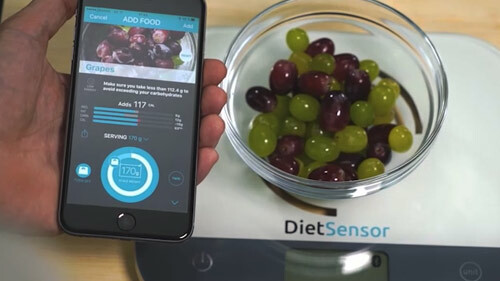 By letting DietSensor be a guide in helping make healthy food choices in grocery stores, restaurants and in kitchens during meal preparations, the more balanced meals will be, thereby maximizing the effectiveness of workouts. The DietSensor application also works hand in hand with fitness trackers such as Google Fit and Apple Health for the ultimate in synergy. There are many different ways to work out. If you’re looking for low impact conditioning, you can turn to yoga and pilates, one of the best ways to improve stretching, agility and mind and body fitness. If you want something a bit more high energy, you could try Zumba. Maybe your personal training goals are a bit more ambitious and you’d rather jump into some heart pumping cardio workouts. Or maybe you want to push yourself to the max with some high intensity interval training or resistance training to max out your muscular strength. Fitness and wellness are perfect companions, and DietSensor is the perfect tool to help you optimize both. Whether your goal is to burn fat at the gym to get in shape, or you’ve decided to dip your toe into workout routines and exercising for the first time for general body toning and conditioning purposes, DietSensor has you covered. Maybe you want to work up a sweat and jump into total body workouts for weight loss or in order to maintain your ideal body weight. If losing weight has been challenging for you in the past, DietSensor is the tool for you. You can harness the full power of DietSensor by connecting it to fitness trainers and trackers such as Google Fit and Apple Health. In this manner, you’ll be sure to optimize your full body workouts. Whether your goals range from losing body fat to the cardiovascular benefits that circuit training can bring you, DietSensor, the most innovative nutrition-based application on the market today can get you there. …their grocery shopping and make healthy choices in the grocery store. Sometimes, we are aware of the broad strokes of what constitutes healthy meals, but the actual detail of that escapes us. For example, we all know that fruits and vegetables are important foods to include in meals, but how many of us know how many fruits and vegetables we should actually eat during each meal? We know that fatty foods are unhealthy for us, but how many of us are aware of the different kinds of fats, including trans fats and saturated fats, and that some fats can actually be beneficial? We’re bombarded by a wide variety of low fat foods in the grocery aisles, but is only eating low fat synonymous with eating healthy? Healthy eating doesn’t have to be complicated,and with DietSensor, the road to healthy eating just got easier. With the DietSensor app, building well balanced meals and choosing heart healthy foods only takes seconds. Good nutrition becomes second nature with our tips for healthy eating. For optimized health and the prevention of health problems and conditions such as high blood pressure, high cholesterol levels, and heart disease and stroke, dieting isn’t the answer despite all the buzz about the next big ‘healthy diet’ fads that are continually being introduced into the marketplace. Instead of dieting, the real answer for disease prevention lies in rebalancing your body’s nutrients, and maintaining this balance over time. Eating a balanced diet is one of the most – if not the most – important healthy eating tips that DietSensor and dietitians and other health professionals can suggest. If you eat nutritious and fully-balanced meals, which includes whole grains, lean meats and poultry, healthy fats, and foods rich in fiber and Omega-threes, there will be no need to boost your diet and spend extra money with vitamin and mineral supplements; you’ll get all of the essential nutrients that your body needs directly from the meals on your plate. DietSensor not only gives your all the necessary dietary guidelines that you need to stay healthy on a daily basis; it is the perfect tool to use to maintain healthy weight. Reaching your ideal body weight is possible, with DietSensor’s barcode reading feature with reads foods’ nutrition facts labels, perfect for guiding you while grocery shopping. You’ll be able to easily track your calorie needs meal-to-meal. Proper portion control is essential for weight loss and it’s never been easier with DietSensor. With DietSensor, you’ll establish healthy eating habits which is the key to optimizing nutrition and health. The application will steer you in the right direction, helping your shiaway from sugary, processed foods. DietSensor strives to educate its users and demystify healthy eating. For example, users learn that fat free fad diets isn’t the answer to losing weight; instead, incorporating healthy unsaturated fats while avoiding trans fat will optimize the process. With all the diets out there, each one minimizing at least one macro nutrient while highlighting another, can they all be effective? Should someone who wants to lose weight focus on fat burning, or should he / she try to boost metabolism? Should he / she count calories and focus on portion control. How credible are all those weight loss tips circling the web? Can all diets be healthy diets?The data says no. It’s been proven that most diets aren’t effective (some reports say as much as 90% of diets fail) in terms of long term weight loss. Sure, in the short term, weight loss can be achieved through dieting, but maintain weight loss is a whole other show. In terms of the health factors, most nutritionists and registered dietitians agree that extreme diets are not conducive to healthy weight loss. If someone wants to achieve real weight loss results, whether their goal is to lose 10 pounds or track their body mass index (BMI), healthy eating should be the foundation of all that follows. The DietSensor app promotes healthy habits and helps dieters make the right food choices, each and every time. The road to reaching an ideal weight starts with choosing the best foods (in terms of nutritional value) for meals and snacking. Diet and exercise are only part of the equation of how to lose weight; successful weight loss starts with the nutritional value of the foods one consumes. With DietSensor, users can lose weight the healthy, sustainable way. …insulin needs by making healthy food choices. The application was designed from day one with diabetes prevention in mind. As the application grew in popularity, so did its range of features. Now, the application has evolved to encompass anyone that wants to follow a healthy balanced diet, and maintain a healthy body weight/ It’s the most comprehensive application in the market for those that value – or wants to value – a healthy lifestyle, that is built on nutrition, diet and exercise. DietSensor has come a long way, from its initial diabetes care focus and singular aim to prevent diabetes in children to its present, all-encompassing commitment to users of all profiles that want to be and stay healthy, including those that need to lower cholesterol levels, reduce hypertension, track carbs, proteins, and fat intake or are interested in losing weight. Reducing risk factors for type 2 diabetes and other conditions was just the beginning, and the apps evolution continues to expand. It’s the perfect tool that provides all the across-the-board, health-related guidelines that users need to stay healthy. …because most people with high blood pressure have no symptoms. As those people feel healthy, they simply don’t get checked. High blood pressure increases your risk for other dangerous health conditions, such as heart attack, stroke, heart failure and kidney disease. All of these conditions are major risk factors for hypertension. Although it’s not possible to control all risk factors for high blood pressure / hypertension, prevention is within grasp. There are preventive steps that can be taken to keep hypertension in check and control high blood pressure and all of its complications. The Centers for Disease Control (CDC) recommends a healthy lifestyle to help keep blood pressure low, and reduce your risk for cardiovascular disease and stroke. According to the CDC, people should eat healthy,control salt intake, maintain a healthy weight, and include physical activity in their regimen. DietSensor was created to do just that; the application guides users to eat healthy, keep their weight down, and can be used as a supplemental nutrition-based tool along with Google Fit and Apple Health. With DietSensor, users make healthy food choices – and healthy eating keeps cholesterol levels, heart disease, elevated blood pressure and hypertension at bay. …much elevated cholesterol or high LDL cholesterol levels in your blood, it can adhere to the wall lining of arteries, build up and eventually block them. This blocking of arteries is a high risk factor for heart disease, heart attack and coronary artery disease. Saturated fats and trans fats are the kinds of fat that raise LDL levels while lowering HDL. High HDL cholesterol levels is a good thing, and indicates that cholesterol is properly collected from parts of your body and brought back to your liver; which undertakes the function of removing it from the body. A heart healthy lifestyle, the kind that DietSensor promotes, is the best treatment for high cholesterol. Just some of the benefits that users of DietSensor gets include expert guidance for healthy eating and weight management. Being overweight will raise LDL levels and lower HDL levels, as does the over-consumption of alcohol. DietSensor helps you maintain nutritional lifestyle changes, which includes sticking to a heart healthy, high in fiber diet that will reduce cholesterol, as fiber prevents your body from absorbing LDL cholesterol. With DietSensor, you can easily make the best nutritional choices and maintain a healthy balanced diet. With the application, you’ll be able to focus on good food choices such as fish – rich in omega-3 -and healthy fats, such as the type of unsaturated fats found in lean meats, nuts, and canola, olive and safflower oils. You’ll easily be able to steer clear of processed, fatty foods that will sabotage your efforts of healthy eating. Download the app for FREE - 80% of the features are FREE.